This page is only for users who do not(!) have Avastar. Avastar users: Please ignore this page! We have created fitted_mesh_270.blend based on the example files provided by Linden Lab with a female and a male mesh, a correct SL compatible skeleton, 2 bonegroups for SL Base Bones and Collision Volumes. The customizable restpose matrix (or bind pose matrix) that was introduced in Blender 2.70 is no longer handled automatically. 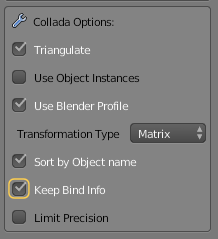 Blender now provides a new option keep bind info which is available for Collada imports into Blender and for the Collada exports as well. 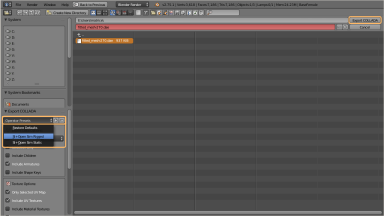 Also the new export Collada option keep bind info is not part of the exporter presets and needs to be enabled manually. 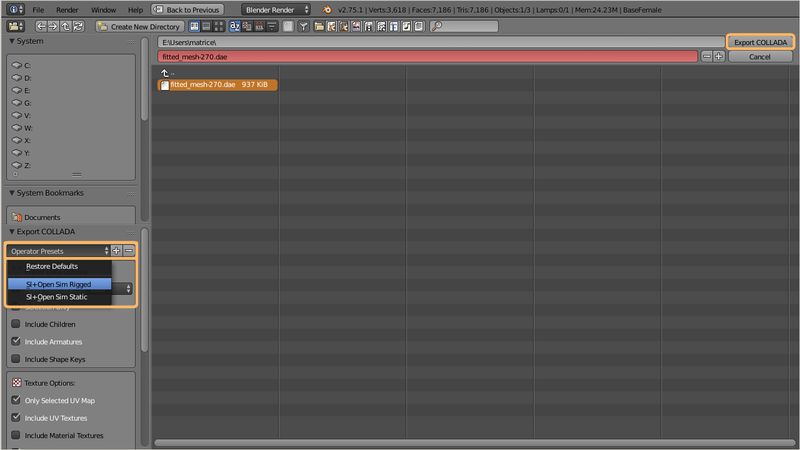 But you always can create your own export preset. To clarify: You need to enable Keep Bind Info when you export fitted Mesh attachments. Since Blender 2.70 the Collada exporter provides very limited support for fitted Mesh. technically this is support for a customizable Restpose Matrix (or bind pose matrix) as it is available for example in Maya. Blender handles this automatically (see last chapter of this page for more details). For versions lower than Blender 2.70 there is no support for exporting Collision Volume bones. Either open Layer 1 to view the female mesh (default) or open layer 2 to view the male mesh. Note: The skeleton (Armature) is located on Layer 10. You can ignore the skeleton for now, the exporter takes care of it when it needs it (see below). If you want to see the Skeleton together with the meshes, then you enable additional layers by using SHIFT LMB (Left Mouse Button). Note: If you have Avastar, then please use the Avastar Rig and the Avastar Collada exporter. Avastar does a lot of special calculations in the background (regarding bind pose matrix, correct rotation, scaling, etc.). Warning: Never export the Avastar rig with the Blender Collada exporter unless you know exactly what you do ! take care to enable Include skin weights You find this option in the Upload options tab of the SL Importer. Note: When you enable skin weights on the preview display (see image) then you often see that the mesh turns partially invisible. This seems to be a previewer Bug. The goods news is: We always found that the uploaded Meshes work properly and do not show these invisible parts. 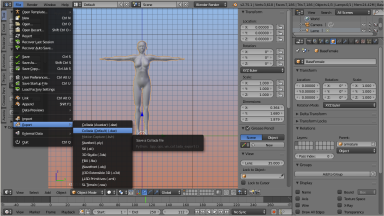 Note: Avastar supports Maya’s bind pose matrix since we added support for Liquid Mesh (collision volume weighting). So Avastar always supported (and still supports) Fitted Mesh out of the box and independent from the Blender version. The meshes are ready for export with the default Collada exporter. Please use the export option “Export for Second Life”, otherwise your export will fail immensely! 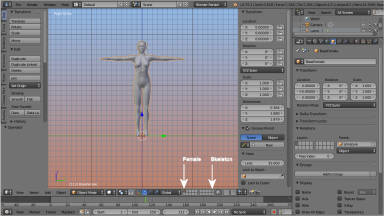 The meshes are fully weighted to a mix of Collision Volumes and SL Base Bones (as proposed by Linden Lab). All bones have been enabled as deform Bones. All mandatory weight Groups have been added. Where are the Collision Bone weights ? These weights are stored in Bone weight groups. 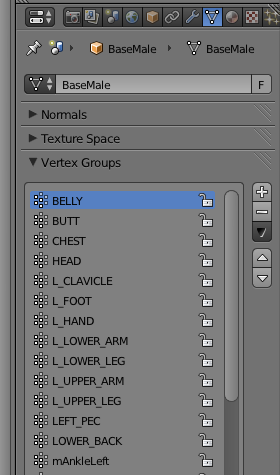 You find the weight groups in the Vertex Groups Panel (in the Object data Properties of the meshes). You probably want to modify the weights. they are not optimal. Note: You can see the weights in edit mode (you need to enable the “Show Weights” option in the Mesh display panel). So how would i do weighting in more detail ? So and what about the in between vertices ? Ok, admittedly fitted Mesh creations are not an easy task. Maybe as a rule of thumb you can keep in mind that we have Skeleton Sliders for the SL Base Bones (also named mBones meanwhile) and Morph sliders for the Collision Bones (cBones). Eventually you have to decide which part of your mesh shall follow which set of bones. It is all a matter of finding the right balance of the weights between the Collision volumes and their related mBone counterparts(mPelvis, mTorso, mChest, etc…). 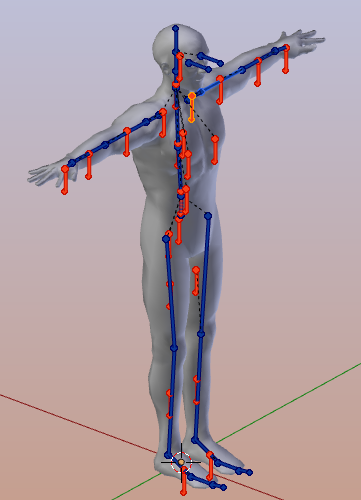 The Bind pose matrix essentially allows to define a Pose for each Bone that will be treated as the rest pose. 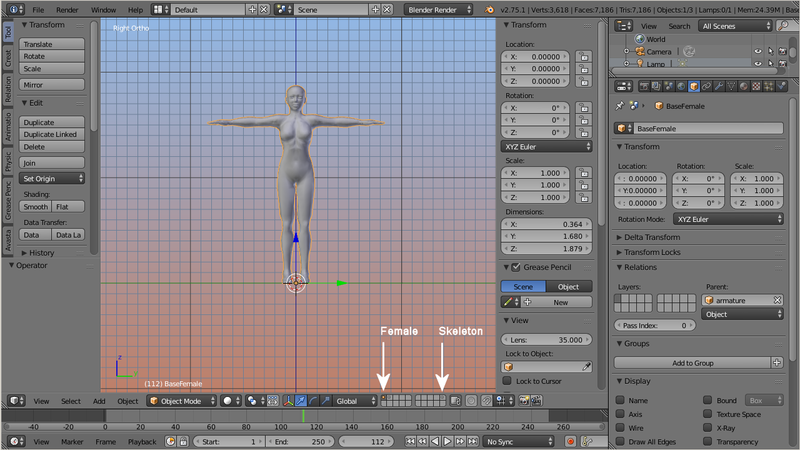 In Blender the rest pose is defined by how the skeleton is arranged in Edit Mode. thus Blender’s Bind pose matrix is always the identity matrix. 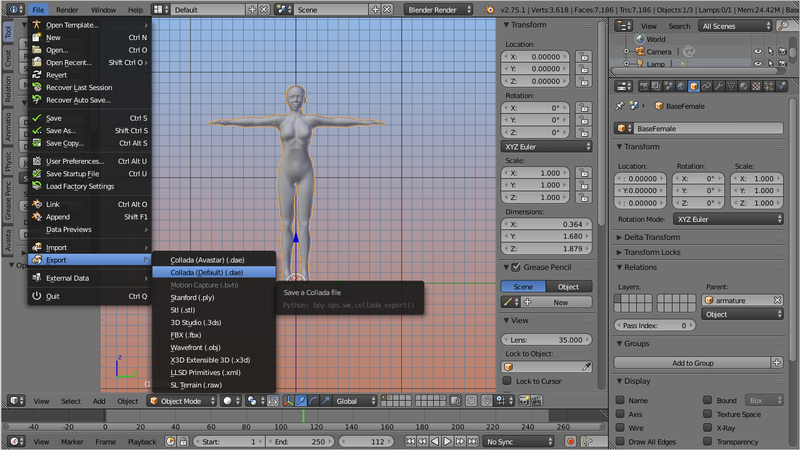 Note: This may be changed in the future as i will propose to add the Bind Pose matrix as an official Blender feature. This might possibly allow us in the future to bind a mesh to arbitrary poses with no extra work. Important: I found by experiment that for the SL Importer we only need the restpose_scale and the restpose_rot properties. 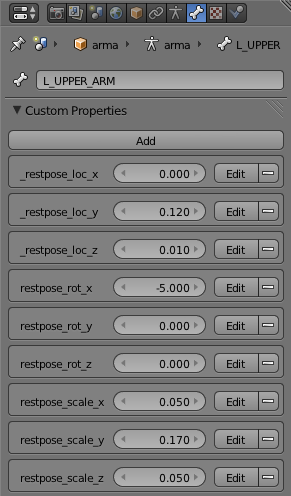 However, since Linden Lab has provided the complete rest pose matrix, i have kept the restpose_loc properties in the blend file, but i renamed them all to “_restpose_loc” (with a leading underscore) to hide them from the Blender Exporter. You find the properties when you place the armature into Edit Mode. then the values show up in the properties sidebar, and they can be edited in the Object Properties window.